KARACHI: Three days before a by-election on a provincial assembly constituency in Landhi, unknown thieves have stolen 1,800 computerised national identity cards (CNICs) from an office of the National Database and Registration Authority (Nadra), police said on Wednesday. The police said that the incident took place in Nadra’s office located in Landhi 3 1/2 late on Tuesday night. The suspects barged into the office and took away around 1,800 CNICs. A case was registered under Sections 457 (punishment for criminal trespass), 380 (theft in dwelling house, etc) and 34 (common intention) of the Pakistan Penal Code on the complaint of a Nadra official. The area where the Nadra office is located falls in PS-94 constituency which had fallen vacant after the demise of a Muttahida Qaumi Movement-Pakistan lawmaker. The by-election in the constituency is scheduled to be held on Jan 27 (Sunday). One of the contesting parties, the MQM-P expressed serious concern over the incident and observed that it was an attempt to restrict people from exercising their right to vote. Speaking at a press conference held to announce joining of a former Pakistan Tehreek-i-Insaf leader, MQM leader Aminul Haq demanded that all the stolen cards be prepared forthwith and given to the people so that they could cast their votes in the by-election scheduled to be held on Jan 27. 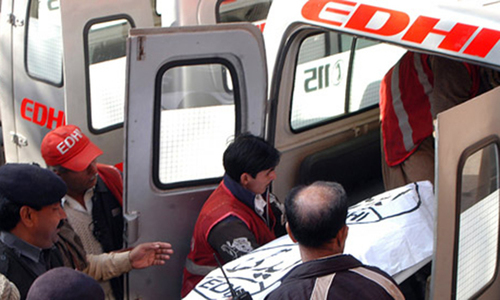 The Pak Sarzameen Party also expressed concern over the incident.